» Want To Make Something Special And Unexpected For Your Guests? In traditional form or modified to your own taste, this home-made liqueur is light, refreshing and the perfect “ice-breaker”. You traditionally serve it ice cold as an after dinner drink to aid in digestion (a “digestivo” in Italian) or even to welcome guests. Limoncello comes from the Amalfi Coast region of Italy. In this region, local Italians unique varieties of lemons to make their own limoncello. You can’t find these lemons outside Italy (not yet at least-see below). So, you’re going to have to modify the traditional recipe if you are outside Italy, at least with the lemons. Regardless, Limoncello, or a modified version, is a refreshing and uncommon drink for just about any occasion. You can serve it to your guests, friends and family, and they’ll appreciate it all the more when you tell them you made it all by yourself! Keep reading through below or use the table of contents here to skip to whatever section you may want to read first. What Are The Two Different Types Of Lemons Used In Italy For Limoncello? Which Other Lemon Varieties Can I Use? So What Do I Do With It Again? Making your own limoncello is pretty simple, it just takes time for the lemons or whatever you’re using to become infused in the alcohol. The home-made version is also pretty light, without the super-sweetness in other lemon or citrus flavored liqueurs that are sold commercially. Since it’s served ice cold, you can always keep a bottle in your freezer for up to a year (maybe longer). That way, it’s always ready for guests, expected or not. Limoncello is made with the sweet lemons that come from the Amalfi Coast. In this region, the Italians still make the lemon-infused liquor for themselves or bottle and sell it commercially. These lemons are the only lemons that, in my opinion, are edible by themselves. They are large and sweet and a distinct component to traditional limoncello recipes. There are actually two varieties of these sweet lemons that are used by locals in making limoncello. The lemons grown on the south side of the Amalfi Coast, in and around Amalfi, are the Limone Costa d’Amalfi (also called Sfusato Amalfitano) lemons. 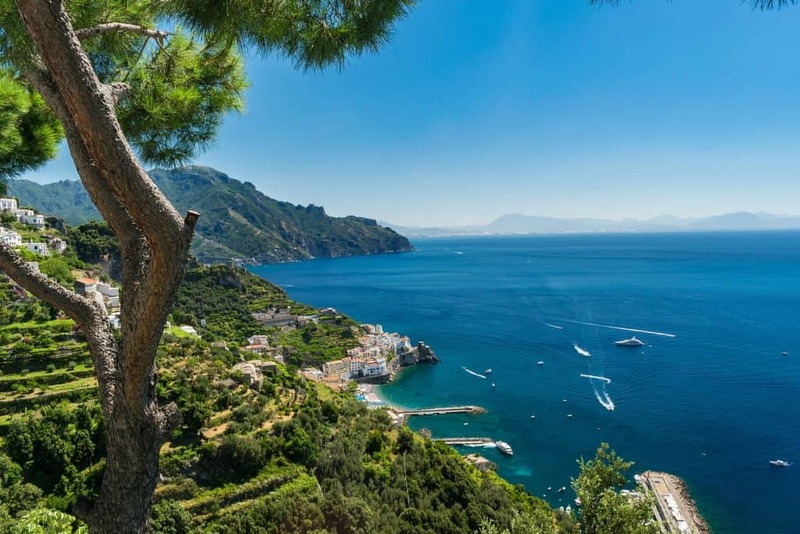 Those near Sorrento, on the north side of the Amalfi peninsula, on the Bay of Naples are Limone di Sorrento lemons. Each of these lemons have the same sweetness in their skins that are ideal for limoncello. The Amalfi variety are a little more pointed and elongated than the rounder Sorrento lemons. Both lemon varieties, as of 2000, are designated with Indicazione Geografica Protetta (IGP) status. This designation recognizes the importance and uniqueness of these lemons. It also gives these lemons the stamp of authenticity. These lemons probably evolved from the Femminello Ovale lemon that was cultivated in larger quantities after about 1150. Arab traders introduced lemons to southern Mediterranean markets through trade in the area from 1000 to 1150. These traders may have introduced these lemons from the Himalayas and elsewhere. Lemons are also even depicted as decorations in ancient Roman artwork. These have been found in the ruins of the “House of the Orchard” in Pompeii, near the Amalfi Coast, but the Romans hadn’t invented limoncello yet. Both varieties of these lemon varieties are grown on the steep hillsides in the Amalfi-Sorrento region. The lemons have evolved in the area’s rich volcanic soil to their present unique, sweet, form. Limoncello has now become popular throughout Italy, rivaling traditional king Campari as the national drink. Of the Sorrento lemons cultivated in Italy, most are consumed there. Not much of the annual crop is exported and a full 60% of the crop goes into making limoncello. In the Amalfi region, individual families often have small lemon groves to use for their own production of limoncello. Each family typically has their own version of limoncello but they generally follow the traditional recipe. To start, use 12 organic lemons. Organic lemons are recommended since they aren’t likely to have pesticides or wax, both of which would not be good to infuse into your drink! You also want to wash the organic skins carefully. Peel them carefully, you want the exterior yellow peel and none of the white rind. You can use a fine grater or a vegetable peeler. If the peels still have white rind in them, you should remove it with a sharp knife since any white rind will only impart a bitter taste to the limoncello. The skins are then put into a seal-able container (at least 2 quarts) with 750 ml of over-proofed grain alcohol. The alcohol in the traditional recipe is typically a mixture of pure grain alcohol and water. Equal amounts of water and alcohol are typically used, so that the watered-down alcohol is about 100 proof. Lower alcohol levels down to 80 proof can also be used. This mixture is then left to “seep” for at least four days and often much longer in a cool, dark place. The longer the seeping the more lemon flavor that is imparted into the alcohol. Also, the lower the alcohol percentage, the longer it needs to seep. One indicator of how much lemon is infused in the alcohol is how pale the skins have become. The skins lose their color as the lemon oils seep into the alcohol. After this initial period, a simple syrup solution is added. Before adding it, however, this base limoncello needs to be filtered. Use either a fine strainer, multiple layers of cheesecloth or even a couple of wet coffee filters as a filter. Then pour the base liquid through the filter to remove any rind residuals. This simple syrup is simple, it’s just sugar and water. Mixtures vary from 40% sugar, 60% water to half and half, depending on your preference for sweetness. For half and half, use 2/3 cup of water and 2/3 cup sugar. For a 40% sugar mix, then use a little over 1/2 cup of sugar and the rest water. If unsure how much, fill 1 and 1/3 cups of water in a measuring cup or glass, and scoop out 1/2 cup (plus a teaspoon). The remaining water is the right amount to use for 60% water. You then combine these two ingredients in a saucepan and heat the mixture almost to a boil while stirring, until the sugar is dissolved. Wait until the syrup cools to room temperature, then add it to the alcohol-infused lemon base. Then, you allow this new mixture to seep for another period in a cool dark place. That period can be as little as four days, but really should be at least two weeks. Longer is better if you have the time, or are making more than one batch. After this secondary infusing period, it is ready for serving or, really, freezing. Limoncello is traditionally served ice cold. So, a good place to store it is in your freezer, that way its always ready to serve. You are unlikely to find either Sorrento variety of lemons outside Europe. Only a small number of Sorrento lemons are exported, and those typically only within Europe. Other areas of the world have their own lemon varieties. The University of California, Riverside, has been growing Sorrento area lemons from imported seeds on an experimental scale for some time. California produces about 90% of the lemons in the United States, so these Sorrento varieties may start to become commercially available in the future. In the meantime, what to use? Typically in the United States, Eureka or Meyer lemons are substituted for Sorrento lemons. In Europe, you may be able to get the real thing! In in Asia, you may be able to get the original lemon, where the Italian variety came from, but they aren’t likely to have evolved in the same way that the sweet Italian varieties did. If you are in other areas where none of these lemons are available, just look for any lemon or even citrus that has a thick, fragrant skin. At this point, if you’ve already altered a key ingredient in traditional limoncello production, so why stop there? Limes, tangerines, oranges, blood oranges and almost any other citrus with a fragrant skin can be substituted for lemons. Just use the same limoncello technique. Be sure to use organic versions of whatever citrus you’re using to help you stay clear of pesticides and wax on the skins. Other tweaks to this recipe include the alcohol. Grain alcohol is still probably best alcohol to use. You can use everything from 190 proof Everclear (if available in your area) to 80 proof name-brand vodka as your grain alcohol. You should note that the higher proof alcohols absorb citrus oils out of the peels faster than lower proof alcohols. Another factor is the amount or percentage of sugar to add to the second stage of seeping. The range is typically from 40% sugar to 60% water, up to 50% sugar. Another tweak is the ageing process. In each step, you can choose to age this liquor longer than typically called for in the traditional recipe detailed above. One thought, make multiple batches while you’re at it. Age one batch for the minimum period and other(s) for as long as you want. If you do make multiple batches, you can probably just forget about at least one of them and see how long it goes. You might also try some of the traditional derivatives like pistachios (pistachiocello). This variety infuses chopped pistachios into the alcohol and simple syrup. Or, “fragoncello” which infuses strawberries along with the lemon peels. There is also “meloncello”, which starts with cantelope chunks steeped in alcohol. You then puree these chunks, strain the puree and add it to a heated and then cooled mixture of simple syrup and milk. You can even use milk instead of simple syrup as yet another modification. These are just the Italian derivatives. You can start from there and tweak accordingly, with nuts, melons, other berries, all in addition to whatever citrus varieties you may come up with. Experiment to taste and preference for all of this, call it your “booze-lab”. That way you can justify all of this time and effort in the name of some type of scientific purpose. Who knows, you may even stumble upon something even better than the traditional recipe. So, hopefully you can see yourself with several different batches and multiple varieties of limoncello or whatever-cello suits you. You can serve it after a lovely dinner that you’ve laboriously prepared for your guests.You can find a few dinner recipes here, here and a great brunch pairing here. Or, be bold and serve it when they walk in the door. Really, you can serve this anytime at all, even just for yourself. As added inspiration, realize that you can use this concoction as a sweetener to any cocktail to really create something new and unique. There’s even frozen popsicles made out of this stuff. So wow your guests and friends by showing them that you created something refreshing and tasty. You’ll stand out by having made something unique! I haven’t tried making my own Limoncello at home. Thanks for sharing this post.This basically answered all the questions I had in my mind about Limoncello.I prefer traditional and authentic taste than the easy ones. I made with green small lime. It has a sharp taste. But it was great. Thank you, I saved this recipe. This is really helpfull information. Thanks a lot for your post keep it up.